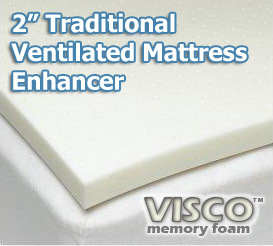 The only memory foam mattress enhancer available with 3 zones of air channels for improved air circulation and support where it’s needed most. Greater air circulation means a more comfortable sleeping temperature and a healthier sleeping environment. Memory foam conforms to your individual body shape to relieve pressure points and provide personalized comfort to reduce tossing and turning. Memory foam also reduces motion transfer so partners sleep undisturbed. Includes two memory foam contour pillows. The contour pillow is designed to cradle the head and neck for proper anatomic support. Ultra fresh anti microbial/anti bacterial treatment is also added. The topper comes with 2 contour pillows in addition which for many people is another plus, but the contour pillows are not something everybody find comfortable. Still, you can’t say whether they’re comfortable for you or not before you try sleeping on one, so I guess it is a plus that they come as a present. For the money this is a good product. If you decide to get it I think you’ll be happy with it. Still, if you can afford something better I suggest you go for it.